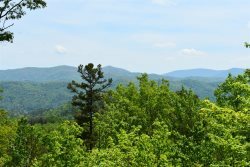 Paradise Lodge is the perfect place to stay for your family’s Blue Ridge, Georgia adventure. Located only five minutes from Downtown Blue Ridge, Paradise Lodge offers something for everyone. Spend time at the cabin playing pool and air hockey or relaxing in the hot tub. Enjoy the wet bar while watching TV, or rent a DVD. This beautiful cabin offers a gas grill and picnic table, so have a cookout for lunch. The cabin sleeps a total of 12 people, with 3 king beds, 1 queen bed, 1 futon, and bunk beds that consist of a full and a twin bed. Paradise Lodge even offers two living spaces. The first living area keeps warm by the fire with a wood burning fire place, and even has a private balcony. Also, in the first living area is a loft where the futon rests. The second living area has unique qualities as well. Find an additional fire place, this one gas logs. You will seek comfort in a jetted garden tub and tile shower! Don’t forget about the fire pit outside. Make an unforgettable evening hanging out by the fire. Have some fun outside the cabin. Head out of the cabin to see local attractions! The Blue Ridge Scenic Railway, Mercier Orchards, fine dining, and miniature golf are all less than ten minutes away! Even take some time go hiking on the various trails in the area to get in tune with nature and see waterfalls. With an elevation of 1830 feet, paved access, and a wheel chair ramp, Paradise Lodge can make a fabulous vacation for anyone! Upstairs has 2 bedrooms(Kings) and a futon in the loft. We had an amazing time. It was a peaceful stay. Thank you!! Excellent experience renting a cabin from Mountain Laurel over the holidays. Only complaint is that the pictures of the cabin and views did not do it justice! Beautiful house, tons of space and great views. Checking in and out was very easy and owners were very responsive. Everything was as described. Had a great time with some good friends! Everything was perfect. I will definitely be using Mountain Laurel Rentals again! Cabin is beautiful and comfortable and has excellent views. Great prices and worth every dollar. Making plans to return next year! All the team members seem to be smiling while speaking. They listen well and provide solutions. Great working with them. This was a getaway weekend for my friends and me- we do it yearly. We will be back to this cabin group for the value and great customer service. She was very friendly and helpful. Very friendly! I even got a phone call to let me know that we could check in early if we were ready. We had a wonderful weekend in the mountains with friends and hope to be back soon!